Just Jingle: Love Cast In Clay Blog Hop with GIVEAWAY and WOYWW! Love Cast In Clay Blog Hop with GIVEAWAY and WOYWW! Welcome to the Love Cast in Clay Blog hop joining the Creative Paperclay® Design Team and the Amazing Mold Putty Design team! I know you have a lot of blogs to visit, so I will keep this one to the point today! Here is the card that I created! I created the mold using Amazing Mold Putty from a necklace that The Hubbums got me for Christmas! After allowing the mold to set (it takes around 15 minutes or so) I pressed Delight™ Modelling Medium into the mold. I like the Delight™ for this because it is so light weight and works great on paper craft projects! Then I allowed that to dry for a couple of days and gave the heart a light coat of red spray paint. Nice and easy and a super fun custom embellishment! So...check out what the other bloggers have created because there is a TON of great ideas out there with these AWESOME products!!! If you comment and follow each blog on the list you will be in the running to win a 16 oz. 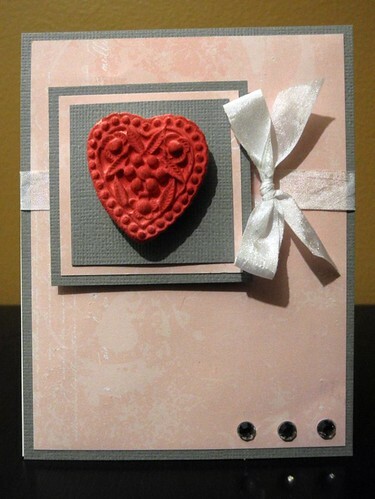 pack of Creative Paperclay® and a package of Amazing Mold Putty!!! That's kind of AWESOME, just say'n. Have fun! It's a fun mess, though, I PROMISE!!! Have a Happy Wednesday, friends!!! Pwaaaa! wow this card is so awesome and i love that heart!! 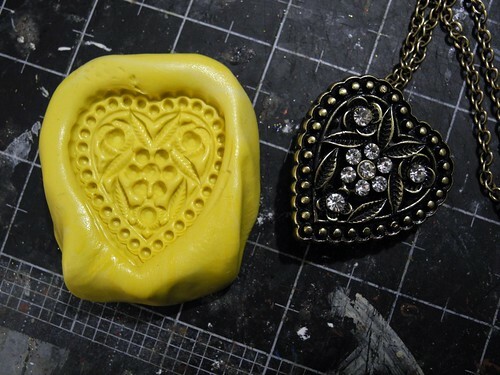 Such a great idea to use your necklace for the mold and it turned out so cute! Jen, your card is just wonderful! What a gorgeous card! I'm sure that mold will get lots of use! I love how you can make a mold from stuff you already have at home. Or how cool is it that you can remake a favorite piece of jewelry?!? I really SHOULD own stock in Amazing Mold Putty! AND in PaperClay! Don't you just love it? And - wow! Your hubby did GOOOOOOOOOD getting you that lovely necklace! It also made a VERY beautiful piece for that card! Cannot go wrong with RED!!!! Wow, Jingle! That necklace from your hubby is gorgeous! I love how you used it to create the heart for your card, which is beautiful by the way. Love, love, love the clay heart!!! The card came out looking great. What a great necklace - and now you can go nuts :) Awesome! Your hubs has good taste! I just love what you did with the products. Love truyly can be cast in clay. oh, how cool is this?! Great job! 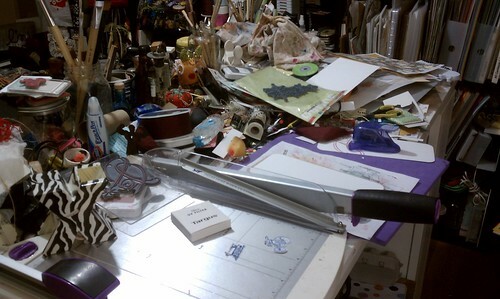 mess isn't really mess when it is a fun mess! 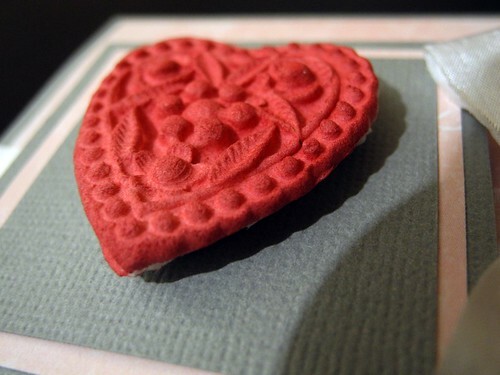 love your clay heart, so pretty! That heart is so cool, Jennifer! I had no idea there was such an easy way to make them. Love your card! What a cool idea, and your card turned out fabulous! 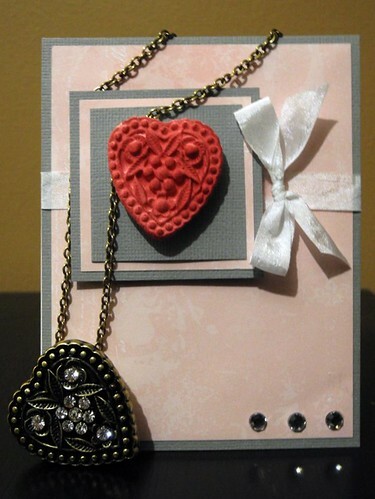 Fabulous card, great embellishment, and I love the necklace too! Lovely! Great hopping with you. Having trouble with the Creative Paperclay and Amazing Mold Putty and Barbara's sites...but I'm following everyone else!!! 12 cards...wow...you have been productive! Your new paper sculpting card is lovely. Beautiful pendant, card and mess! A dozen cards in a day? wow! I'm working my way through this weeks WOYWW - I’m over half way through now! What a stunning card!!! Wow, I have all kinds of jewelery that would be perfect for this. Tfs! Applause for the hubbums and for you for making this cool heart!